6:00AM: My alarm is terribly loud, mostly to make sure I don’t hit the snooze and have to hear it again. Untangle myself from both pets and husband, but eventually make it out of bed. Clean jeans today! That sometimes can feel like a bit of a luxury. A little time to fully wake up and check messages, then out the door I go. 7:00AM: Set up the machines, prep for milking, fill the water buckets by the dairy, and then bring the girls into the holding pens. Most of them come along easily enough, but Witchcraft and Scary slip away to go sit by the other door. They’re too good to be around the others goats or something. A couple ladies lean against the fencing – Arby the Nigerian Dwarf buck is on the other side snorting and stomping. I make mental note of who those girls are. There’s still some time left before milking and it’s the only time of day I don’t feel like I’m boiling alive, so the boss and I catch a few does and check their feet, vaccinate them, and shove pills filled with copper rods down their throat. This makes them upset and they keep their distance afterward. 8:00AM: Time to start milking! I turn the machines on and open the door. I’m almost immediately nearly crushed to death by a flood of overeager milking goats. The first line is mostly Nigerians, and they mostly follow the routine. While they’re on their way out, Bumble runs inside and needs to be caught and removed from the parlor. 8:30AM: Halfway through milking, and it’s already starting to get hot outside. Upon letting the third line in, Larkspur – a black La Mancha – stops long enough to poop all over the doorway, then runs up the stand, leaps off onto the floor again. She squats and pees, then trots her merry way back around, pooping the whole way. I decide I no longer like Larkspur. Bumble needs to be removed again. 8:45AM: The final line. Everyone goes in easily enough, until Dill Pickles makes a break for the other door. I’m wise to her tricks, and grab her by the long hair on her rump. She outweighs me and I slide along behind her flat-footed until she mercifully stops by the door. I’ve invented goat skijoring. I rethink my life choices and make her get on the stand to be milked. I discover that Macy escaped while I was distracted and needs to be fetched back. This is a regular occurrence with this very large tan La Mancha doe. 9:00AM: The last line leaves, I throw Bumble out one last time, and shut the machines down. Cleaning the equipment is currently a mercy, as the air conditioning in the rest of the dairy is much better than in the parlor. I rush through sweeping before the heat gets the better of me, and escape the dairy. The goats immediately shout at me to let them out for browsing. But this is breeding season and there are things to be done before they can go. 10:00AM: I pull out Arby and take him for a walk in the herd. He tries his best to mate with every doe he gets close to. Most of them run away or try to give him a bashing, but a few are more receptive. It’s already too hot and I shove him back in his pen, where he immediately begins complaining. I catch several does and drag them to various pens on the property. In each pen is a buck that smells bad enough my eyes sting. One doe refuses to be caught and has to be herded into a smaller pen and then tempted with grain. I resist the temptation to choke her with the leash. Finally I let the goats out. The Z-Team, three huge Livestock Guardian Dogs, race out to join them, nearly knocking me down. 11:00AM: After a quick break to check messages, back out I go. There are currently seven different pens that need water buckets cleaned and refilled, and hay delivered. Can’t forget the water up front for the browsing herd too. I make my way pen by pen. Most of the bucks are distracted and leave me be. Nobby, a big chocolate La Mancha buck that is entirely too friendly, decides to ignore his current ladies to rub against me and beg for pellets. My pants are no longer clean. 11:50:AM: Finally I’m finished. I head back to my house to take a break and eat lunch. Except as I approach, there is another doe hanging around the buck pens, flirting unashamed as Forest, a big Nigerian Dwarf buck, bellows his desire. Too bad for him this girl goes with Twister. I reach out to grab the doe’s collar. 12:00PM: I finally catch the doe and unceremoniously shove her in with Twister, who immediately jumps on top of her and goes to town. I realize Forest has knocked his hay to the ground, so I go into his pen to fix it. I look down to see him spraying urine all over my boots and pants. Great. I escape and finally make it inside. 1:00PM: The herd is back because it’s just too damn hot to stay out. I refill all of the buckets in front for them, including two that need to be cleaned once more because Big Z decided to stand in them. A big La Mancha doe goes to flirt with the bucks, so I catch her (easily for once) and take her to see Marty, our massive La Mancha buck. 2:00-3:00AM: It’s too dang hot to do anything outside at this point, so I focus on whatever work I’m behind on on the computer. It’s a never ending list. The goats hide in the shade and nap. I end up spending most of that time answering messages and watching Youtube instead of doing anything useful. I almost forget to eat my now wilting salad but bolt it down at the last minute. 4:00PM: Unpeel myself from the computer to head back outside. Prep for milking, refill all the water buckets. I release all of the milking does that are in with bucks, and they run gleefully back to the herd. The bucks complain. Twister, Forest’s neighbor, makes an attempt to follow and needs to be wrangled back into his pen. Now my arms and hands smell as bad as my jeans. There is another doe begging to go in, but she is a milker and will just have to wait until afterward now. 5:00PM: With the goats safely penned in the outer holding area, I take this chance to refill the alfalfa in the interior holding pen. The goats see this and begin feigning for a hit of that sweet, sweet alfalfa. I open the gate for them and am nearly drowned in a flood of four legged bodies. 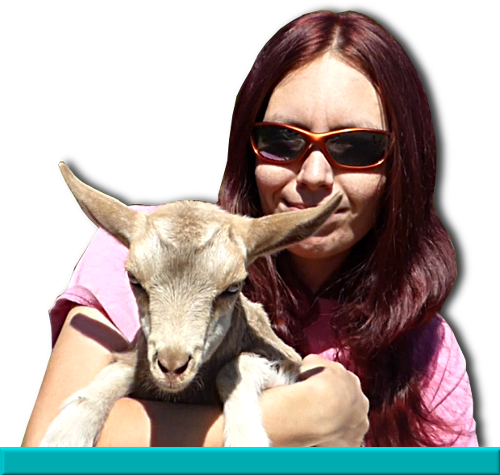 I manage to survive, and have to throw out several goats that don’t have udders between their hind legs. 6:00PM: Milking starts, and for once, goes smoothly. I only have to throw out Bumble once, though she lays by the door and looks up at me sadly every time a line goes out. I feel sorry for her and let her come in and get a handful of pellets, ensuring that she will continue to be a complete pest. 7:00PM: Milking is over. I clean the equipment, check the temperature of the milk in the chiller, and close up the dairy. The concrete pads in front need to be scraped clean of goat poop. I stop halfway through to answer a message on my phone. As I’m refilling all the buckets (again), I remember the doe that needs to go in with her buck. I walk around the herd three times before I finally spot her snoozing in the barn, and shove her in with Nobby. I have to walk uphill both to work and to go home, thanks to the layout of the property. I can’t wait until it snows again so I can complain properly about it. 8:00PM: I look at the food I could cook for dinner. Instead I text my husband to bring home Taco Bell. Peeling off my clothing, I leave it in the bathroom so that he can also enjoy the smell of bucks in rut. I stay awake just long enough to watch a few more Youtube videos and browse Facebook. I post a picture and chat with a few friends. The goat records get updated with today’s matches. 10:00PM: The best time of the day. Bedtime. Tomorrow comes early, and is sure to bring it’s own unique adventure – not just during breeding season, but every season.